Theme 5: Good data visualization leads to smarter decisions. In 1854 London was the biggest city the world had ever seen, and was literally drowning in its own filth. There was no sewage system in place and those that lived in the capital literally threw their waste and cesspits out into the crowded streets and river Thames. As a result, London was a disgustingly smelly place to be and was periodically engulfed by disease – most notably Cholera. However at that time it was believed that it was the smell of London that was the root cause of diseases such as cholera. It came to be known as the Miasma theory of disease. However, Dr. Snow was skeptical of the Miasma theory of smell causing disease and in his 1849 essay On the Mode of Communication of Cholera actually introduced the water borne theory of Cholera. He presented his findings to London’s health authorities but couldn’t convince anybody of its merit, and was largely ignored. In August, 1854 there was another outbreak of cholera in the Broad Street neighborhood. Over a 10 day period cholera decimated the population; 10% of the neighborhood died. Since Dr. Snow was convinced that Cholera was a waterborne virus, it didn’t take him very long to identify that it was the infected water pump at 40 Broad Street that caused the epidemic. 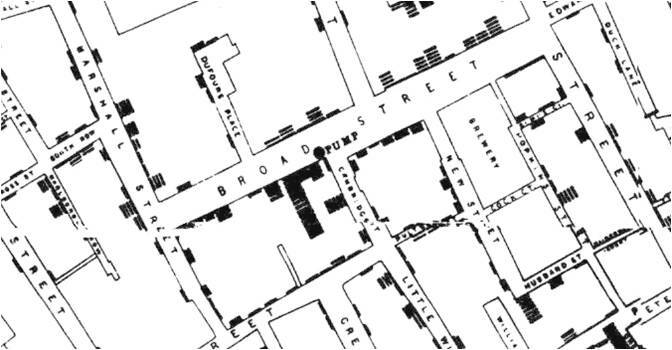 Instead of solely relying on numbers, he produced a visual of the Broad street neighborhood where he marked the water pump at 40 Broad Street and designated each cholera death with a bar. The concentration of deaths around the pump at 40 Broad Street, which trailed off the further out from the pump one went, was so convincing that the authorities finally accepted the theory of Cholera being water borne. They removed the handle of the pump and it ultimately stopped the spread of the disease in 1854. It also paved the way for a sewage and sanitation systems to be put in place; one of the greatest engineering feats to be undertaken in London’s history, changing the way that urban systems exist and continue to grow to this day. As the story demonstrates, good data visualization leads to smarter decisions. Far too often, analysts focus all their efforts on data collection and modeling and pay very little attention to presenting the results in a way that decision makers can relate to. Every successful predictive analytics project leads to a change from the status quo way of doing things, and it is never easy to convince the decision makers that the new way is better. Most decision makers need more than R square or a mean absolute percentage error metric to be convinced about the efficacy of a solution based on predictive analysis and feel comfortable approving the change. This is where data visualization skills become important. James Taylor wrote that visualization is more relevant in context of strategic decisions and not so much for the operational decisions. Decision making at the operational level is too high-speed, too automated for much in the way of visualization to be useful at the moment of decision. While I do agree with him, I know of instances where visualization has been creatively used in the very operational environment of call centers. Speech analytics and emotion detection are growing areas in call center technology where depending upon the choice of words, the speech analytics system detects the emotion level of the caller and displays an appropriate emoticon on the agent’s desktop right when the call is transferred to them. Even without understanding the complexity of the caller’s issue, the agent immediately gets a guidance about the emotional state for the caller. As consultants we are always trying to create that ‘money-visual’ in our presentations, a slide which brings all the analyses together and unambiguously calls out for a need to change or drive action. I feel every predictive analytics project needs one such ‘money-visual’. Do you have any examples of visuals which you have used to convince people to drive change? Further to Amaresh’s point about the power of visualization to help influence decision makers, a new book called “Switch: How to Change Things When Change is Hard”, emphasizes that those wishing to drive change need to appeal to the emotional minds of their audience (through visualizations that create an emotional reaction), not just to their rational minds (by only providing facts and figures – like the “R square” mentioned above). Analysts often struggle to achieve their desired impact with decision makers. The book contains some excellent business examples and guidance that might help us all get our messages across more convincingly. You put it very elegantly. I have heard a lot of good things about the book and plan to read it. Thank you for reading and the comment.